Located on the ground floor of the new high rise student accommodation complex, Oaks can be found at 2 Bromley Place just off of Maid Marian Way. The location of Oaks is pretty central and only a few minutes walk from both the Victoria shopping centre and the Old Market Square. 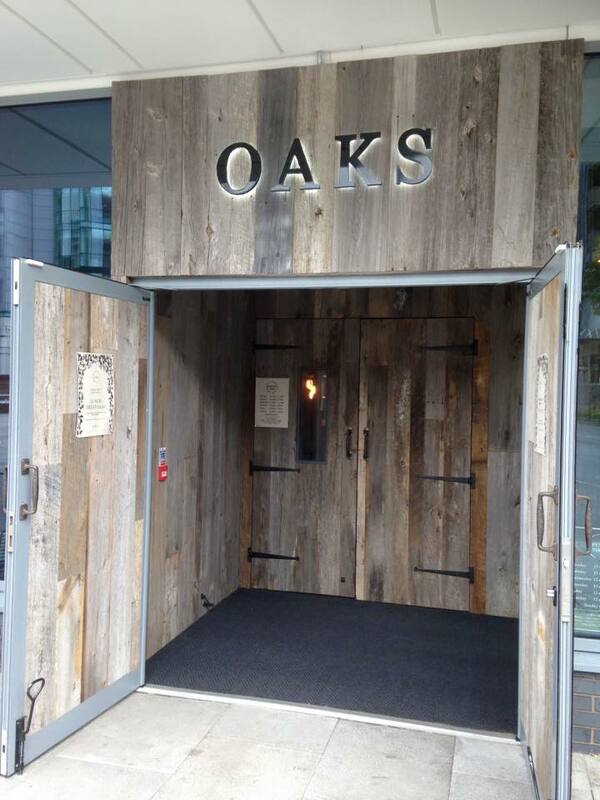 Oaks, Nottingham is a 90-seater restaurant and bar offering a unique dining experience. They have a commitment to serving simple and locally produced sausages and meats cooked over wood embers. In addition to this they also serve local craft beers and cocktails. The first thing that really hit me when entering oaks is the time and effort that must have gone in to preparing this venue to such a high standard. I loved the fact that it was very spacious and all open plan. It’s great to be able to see the chefs prepare your food on the smoking hot grill, not only does this great a sense of theatre but it also allows for all of the fantastic smoky smells to fill the restaurant to induce the appetite. The dinning area was really nice, well themed, and rustic yet smart. There was a range of seating for couples, small groups and even banqueting style long tables for larger parties, all carved out of oak to add to the already impressive decor of the place. Choosing what to have was a difficult task as it all sounded so nice. Serving a range of food from 48 hour marinated chicken to burgers and handmade sausages created by their own chef’s. They offer a good range of food that is unique to their restaurant. Their sausages were varied from chicken, pork, beef and lamb providing the base to just some of their star creations. Furthermore, as I inspected the menu their sides sounded really tasty too. With the choice of hand-cut-chips, corn on the cob, slaw and truffle mash being just a few of the tempting things that were on offer. Upon entry we were seated quickly and tap water was bough straight over, as we decided on what we were going to have from the menu. Our food order was taken quickly too and the service was fantastic with our drinks being filled up as soon as it was needed. To start with I opted for the beef quail scotch eggs, £3.75. Once this arrived I was advised that their mustard and horseradish sauce would compliment this dish well. You got two scotch eggs that were cut into halves. Not only did they look great, they tasted it too! 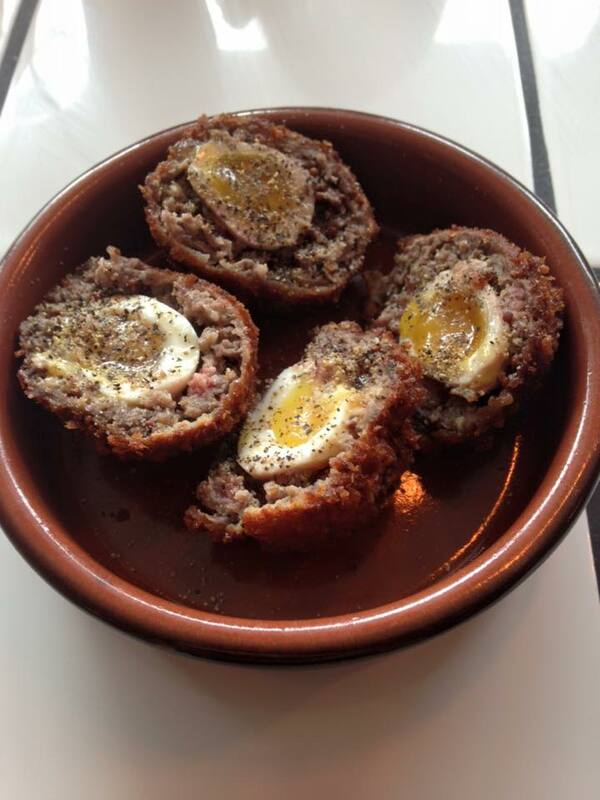 Crunchy on the outside and moist on the inside and unlike a traditional scotch egg they were made from minced beef. Seasoned with black pepper and a few mustard seeds the beef held together well to form the casing to the eggs. The eggs themselves were cooked perfectly and still had runny yolks that were full of flavour and combined perfectly with the beef. 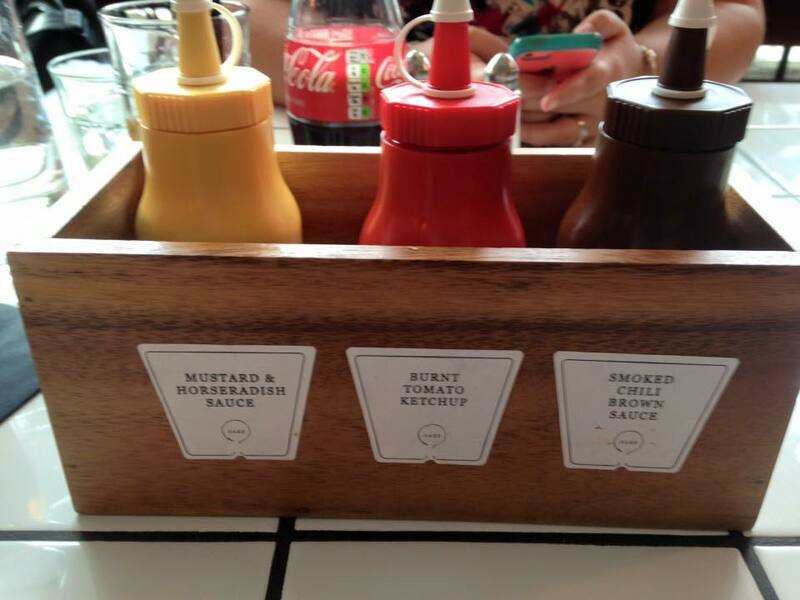 In addition to the items on the menu, their sauces were also an integral part of the overall dining experience. Three homemade sauces, made in house by their chefs, and they also gave recommendations about what sauces work well with what food. Smoked chilli brown sauce – This was rich and smoky in taste with a nice added kick of the chilli. Burnt tomato ketchup – To me this had a balance of taste between both fresh and sundried tomatoes as it had a slight sweetness to it. This had a more unique flavour than those of the branded varieties. Mustard and horseradish sauce – This had quite a strong and fresh taste to it that was amplified by the addition of the horseradish as this added an extra kick and more flavour to the sauce. 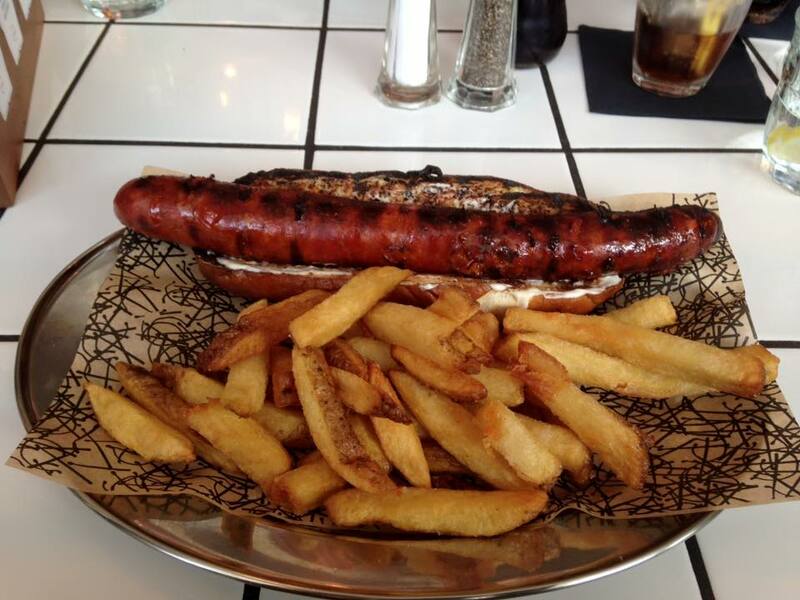 For my main I went for the chicken, asparagus, ricotta, sage and lemon zest sausage, £5.95. I then added a pretzel bun for it to be served in for an extra £1 and decided to get a portion of their hand cut chips on the side, £2.50. so in total the cost of the main was around £10, which is actually really good value considering the quality and massive portion sizes that you get. The sausage was concealed in a traditional casing of pork intestines. The chicken was succulent and tender and contained a good amount of even sized chunks of asparagus, that added both colour and flavour. The sage seasoned the chicken perfectly and the lemon zest increased the flavour, whilst the ricotta added a slightly creamy taste to finish off the combination of flavours. Overall, the sausage was slightly smoky and charred from the cooking process, which left the skin slightly crispy. The pretzel bun was crunchy and charred at the edges but soft, chewy and fresh on the inside with a slight saltiness. The skin on fries were light and fluffy, soft on the inside and nice and rustic due to the skin being left on. They were cooked well and were golden. For dessert I went for their speciality doughnuts. 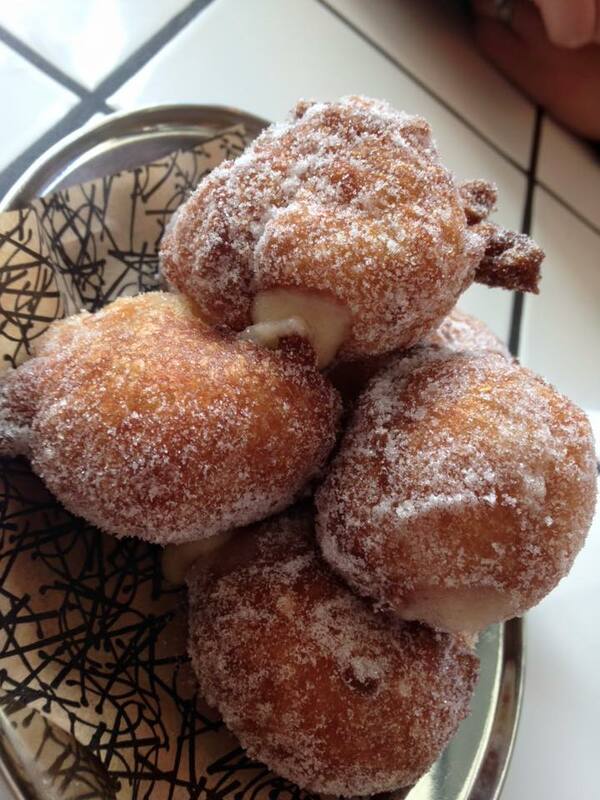 Doughnuts with Marsala cream, £4.50. You got around five small doughnuts that were freshly piped before being served. They were served cold and finely coated in sugar to add extra sweetness to them. I liked how they were crunchy on the outside which was accentuated by the sugar coating, yet light and soft inside. The sweet taste of the wine used in the cream compliments and works well with the cream, adding a slightly fruity, yet refreshing taste. I also liked the slight tang that was added with the inclusion of lemon zest. Overall, I was very impressed with a different take on a popular dessert and found the filling refreshing and lighter than a more traditional jam or custard filling would be. Overall, I found the food to be of a good standard and their food unique. 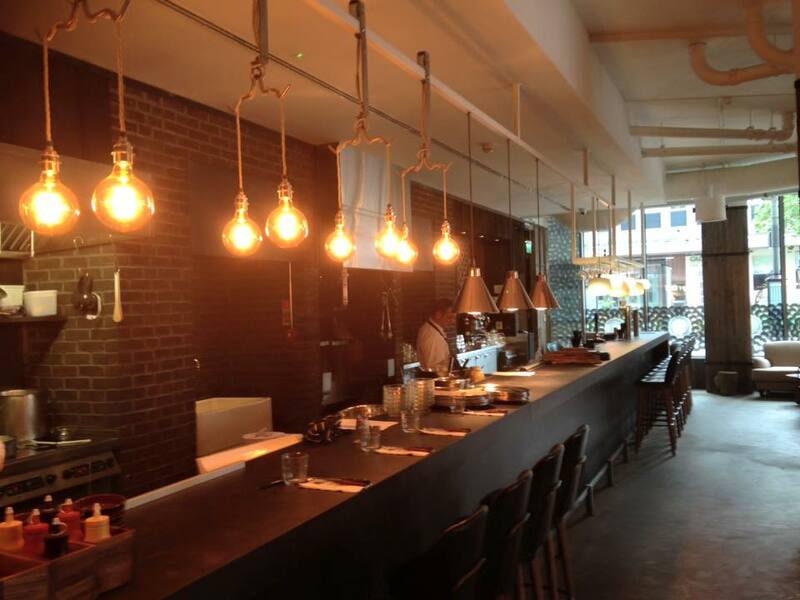 The venue is adaptable and would work well for couples or larger groups for work parties. The service was very good and extremely attentive and we were asked if we needed anything else and how our food was throughout. This place is definitely worth a visit. Location: Oaks, 2 Bromley Place, Nottingham, NG1 6JG. Opening times: Monday to Wednesday 12PM – 11PM, Thursday to Saturday 12PM – 2AM, Sunday – closed.